We hoped to minimise excavations; thankfully the building regulations inspector came and peered into our relatively shallow foundation trenches and was content with what he found there – a subsoil commonly found locally known as ‘shillet’, made up of broken up soft slate and shale. 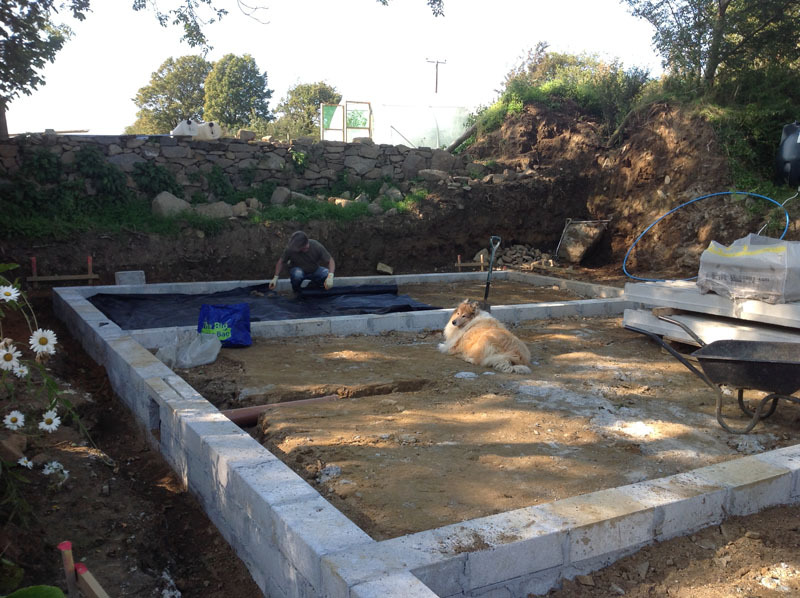 This meant we could get on with pouring a relatively small amount of concrete – a layer about 20cm deep. The concrete lorry was due to arrive at 7:30 the next morning and we had been told that he wouldn’t be able to get down the drive, so we would have to shuttle the concrete from the road in a small dumper truck. Everything was ready, so imagine our surprise when we saw this reversing down the drive towards us – especially as it was completely blocking the drive and I still had to get out to get to work! A small amount of stress and a very late departure later for me, and the foundation concrete was poured within an hour or two. 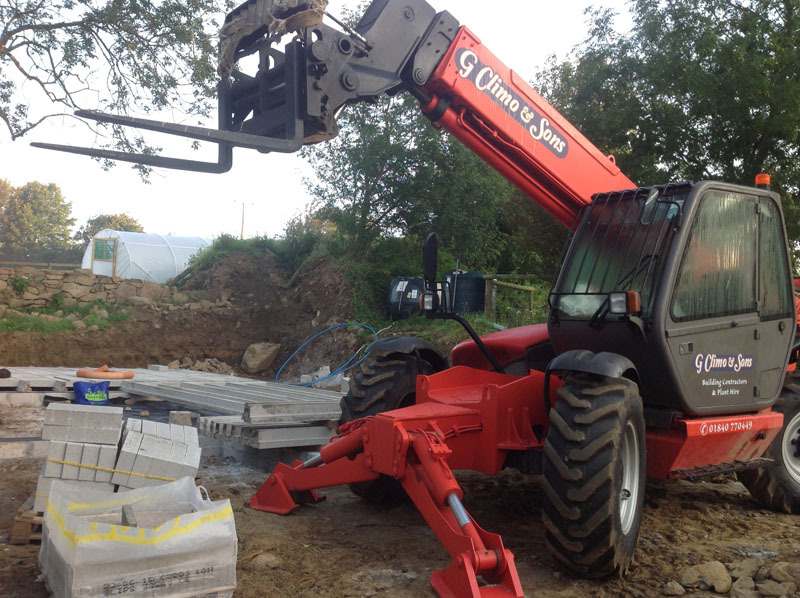 A couple of days later the blocks were delivered. It’s been rather a wet August and the lorry driver managed to get bogged down and had to be pulled out by our friendly neighbouring farmer. 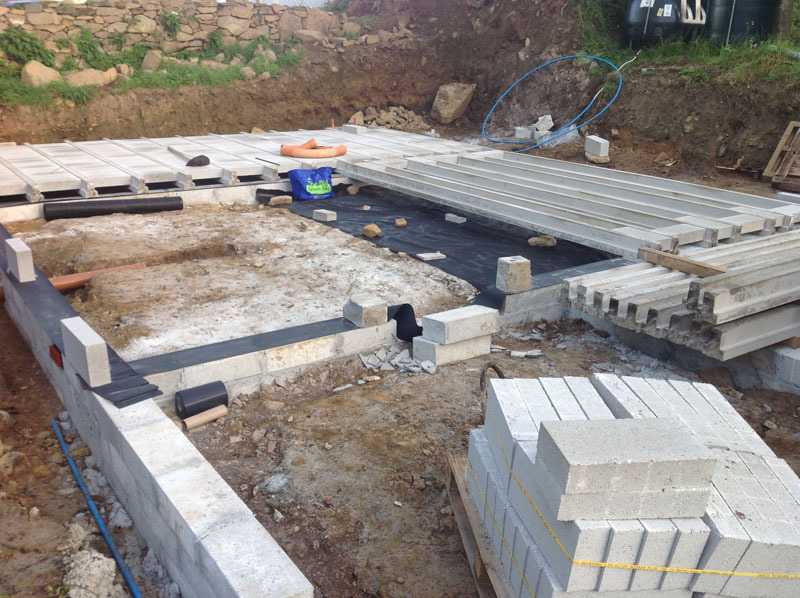 The foundation block-work went in lovely and quickly – three courses of blocks to get us just clear of the ground surface and to provide a base for the block and beam floor. Over the course of a weekend, Nigel and I then backfilled the foundation trenches with a mixture of soil and the waste concrete from the old barn floor, avoiding the need to have this taken away and landfilled. The block-and-beam floor system had a number of features that appealed to us. By raising the cottage floor slightly off the ground, it deals with any potential issues with radon accumulation, which is a local consideration. By floating the floor, it also provides great benefits in terms of insulation, particularly when combined with a thick layer of insulating material between the block and beam and the finished floor surface. Finally, we were told that we would probably be able to manage some of the labouring on the floor construction ourselves, something that we are aiming to do wherever possible to reduce costs. Unfortunately, the beams were delivered rather inconsiderately while we were out at work, in such a way that we weren’t able to start installing them ourselves without heavy lifting equipment. We then waited a couple of days for the next set of builders to turn up, after which it became clear that they’d had a better offer and weren’t going to bother with our small job. The guys who did the foundation works were great, and lept into the breach at short notice to help us out, for which we’re very grateful! The system appears to work very well and went in with very little difficulty, despite our lovely builders being caught rather ‘on the hop’! The block and beam eventually took four days to complete, and was finished, with an extra layer of blocks above, by this morning. We were expecting the house walls to arrive on a lorry today, but that’s a story for the next blog post..!